1. Preheat the oven to 400°. In a small bowl, mix the spices together. In a medium bowl, toss the carrots, onion and 2 tablespoons of the Harissa olive oil. Add 1 tablespoon of the spice mix (saving remaining spice mix for Quinoa) and toss to coat. Spread the vegetables on a rimmed baking sheet and roast for 20 to 25 minutes, until tender. 2. Meanwhile, spread the walnuts in a pie plate and bake for about 7 minutes, until golden. Let cool, then coarsely chop. 3. In a medium saucepan, combine the quinoa with 2 teaspoons of the spice mix and the water and bring to a boil. Cover and simmer over low heat until the water is absorbed and the quinoa is tender, about 17 minutes. Uncover, fluff with a fork and let cool slightly. 4. In a large bowl, whisk the remaining Harissa olive oil with 3 tablespoons of the Honey Ginger balsamic vinegar, adding remaining spice mix (if any). Salt and pepper to taste, or add one teaspoon of Dijon Mustard, if desired. Add the salad greens, Quinoa, roasted vegetables, cranberries, walnuts, and toss to coat. Finish with Parsley. If presentation is a must, toss the greens with half of the dressing first, and spoon Quinoa mix on top of greens with remaining dressing. Bring extra-large pot of salted water to boil. Add kale and cook until almost tender, about 8 minutes. Drain. Rinse kale under cold running water. Drain again. 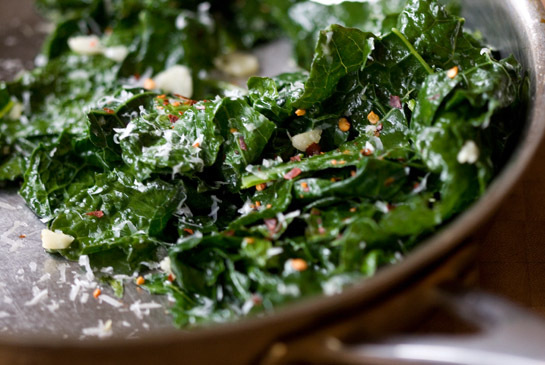 Coarsely chop kale. DO AHEAD: Can be made 6 hours ahead. Cover and chill. Heat Chipotle Extra Virgin Olive Oil in large pot (preferably nonstick) over medium heat. Add shallots and sauté until tender but not brown, about 3 minutes. Add garlic and capers; stir 1 minute. Stir in kale and sauté until tender and heated through, about 7 minutes. Season to taste with coarse salt and pepper. Transfer kale to large bowl and serve. Preheat the oven to 500°F, and preheat a cast-iron frying pan or a roasting pan in the oven. Wash and drain the asparagus, snapping or cutting off any woody ends. Carefully remove the hot frying pan from the oven, and put a little of the olive oil in the; it should thin immediately from the heat of the pan. Place the asparagus on top of the oil, and pour the rest of the oil over the asparagus. Toss of shake the pan until all the stalks are coated with oil, and put the pan back in the hot oven. Roast for 10 to 15 minutes, shaking the pan occasionally to make sure the asparagus aren’t sticking. After 10 minutes, remove a stalk and see if it is done to your liking (cooking times will vary according to the thickness of the stalks and their freshness). The goal is crisp-tender asparagus with slight char marks. 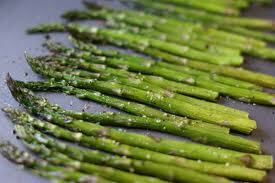 When the asparagus are done, remove them promptly with tongs, leaving the oil behind in the pan. Serve, grating fresh lemon zest or cheese over the top if desired. Goes swimmingly with a salmon entrée!